There are dynamic synergies between some of the traits of early adolescence and early and mid-stages of Alzheimer’s. 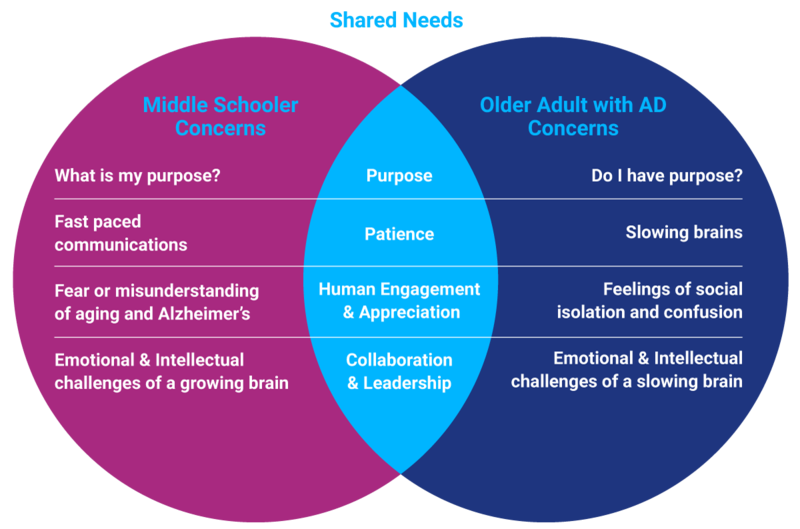 We believe these synergies contribute to the transformative engagement of adolescent children and adults with Alzheimer’s, paving the way for more successful outcomes for each of them, their families, communities and society at large. During the adolescent years, a child’s body and mind experience dramatic changes and our youth begin to question their competence, identity and purpose. According to Erik Erickson’s Eight Stages of Psychological Development, in the fourth and fifth stages, labeled as “Competence: Industry vs. Inferiority – ages 5-12 yrs.” and “Fidelity: Identity vs. Role Confusion – ages 13 – 19 yrs.”, the young person either obtains a strong sense of self or struggles with their role in society. Individuals question: Who am I? What can I be? This is when individuals have an increased vulnerability to negative peer relationships and also the capacity to define themselves by their positive human engagements. Will the child become a competent, confident and empathic collaborator, contributing fully to their family, community and society at large? These same dynamics impact adults living with Alzheimer’s, on the verge of retreat. Their bodies and minds are also experiencing dramatic changes; they too question their competence, identity and purpose. Will they either stay with us a little longer and improve the quality of their last chapters for themselves, their families and their communities, or descend into a downward spiral which can become emotionally, financially and physically devastating? We believe the reason so many of our Sweet Readers and Young Leaders have breakthrough experiences with their adult partners is because in connecting with each other, they serve their shared needs to have purpose, be valued and develop patience, competence and empathy.